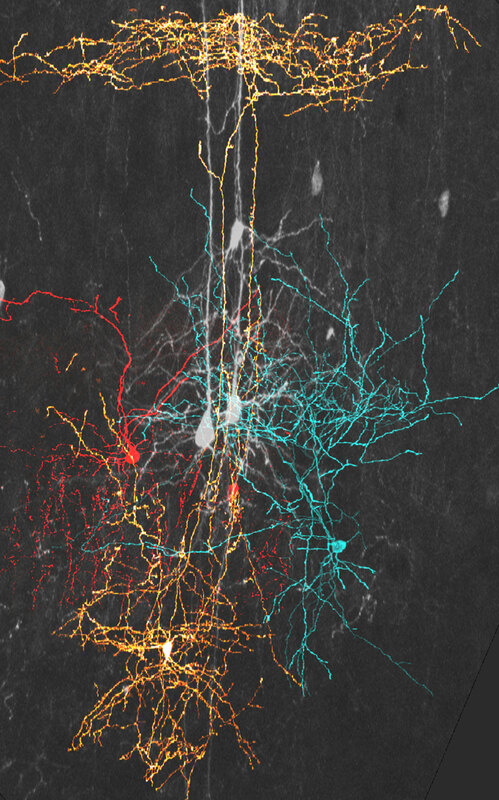 The Rico lab’s latest paper, out now in Science, describes their novel findings that interneuron-specific connectivity is regulated by distinct molecular programs. Their research gives us an insight into the building of cortical inhibitory circuits and thus insight into the development of aspects of cognition such as information processing. The development of brain functioning depends upon the construction and organisation of neuronal connections into functional networks and circuits. Circuitry in the mammalian cerebral cortex is perhaps the most complex and comprises excitatory pyramidal cells and inhibitory GABAergic interneurons. Different types of interneurons are known to target distinct subcellular compartments in pyramidal cells and GABAergic interneurons show specific connectivity patterns that mould some aspects of our cognition. 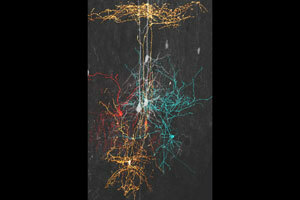 In their paper, Emilia Favuzzi , Ruben Deogracias and Beatriz Rico describe how although a lot of work has been done on understanding the diversity of interneurons in the cortex, until now we knew little about interneuron-specific connectivity and the processes that control it. Imagine that at home you need to plug in your appliances but each appliance has a different plug that only fits a specific socket - UK plugs fit UK sockets, USA plugs fit USA sockets, EU plugs fit EU sockets. What we have described is something like that. Each type of interneuron makes synapses that only contact specific regions of the pyramidal neurons using an specific molecular code established during brain development. But, what if use adaptors? Could we connect an EU plug to a UK socket using an adaptor? Yes we can and that also works for neurons. The authors go on to describe their elegantly-designed study. They first determined the temporal dynamics of the formation of specific inhibitory synapses and then identified and manipulated genes that are differentially expressed during this phase in different classes of interneuron. Distinct, temporally specific transcriptomic profiles emerged in developing interneurons and the authors went on to identify the genes most associated with type and stage of synapse formation specificity. Beatriz and her colleagues identified three genes: Cbln4, Lgi2 and Fgfl3 that are required for the development of dendrite-, soma- and axonal initial segment-targeting synapses made by somatostatin-expressing (SST+) interneurons, parvalbumin-expressing (PV+) basket cells and chandelier cells, respectively. Understanding brain function (and dysfunction) begins with the knowledge of how neuronal connections between different cells are established. How, during development, does an axon find the right partner to form a synapse that not only functions but also lasts for a long time? We focused on inhibitory connections and found that the presence of different synaptic molecules in different cells is key for them to establish connections onto specific targets. Therefore, our study shows how evolution generated complexity and diversity in our brain: by creating different building blocks and by combining them with superb finesse. Strengthening their findings, the authors manipulated expression of Cbln4 in SST+ interneurons and expression of CBLN4 in PV+ basket cells. They found that Cbln4 specifically promotes the formation of GABAergic synapses onto the dendrites of pyramidal cells, a feature unique to SST+ interneurons, but cannot trigger the formation of generic inhibitory synapses. In daily life, animal behaviours rely on precise connectivity between different neurons in the brain, resulting in an exceptional level of complexity in the mammalian cerebral cortex. In this new work from the lab, we identified a repertoire of cell-specific molecular codes that emerge during development in cortical interneurons to provide the exquisite precision of inhibitory circuits. Unravelling, this code is critical not only to grasp the diversity of neural circuitries but also to design future strategies for targeting neurodevelopmental disorders linked to interneuron deficits such as autism, schizophrenia and epilepsy. These persuasive findings demonstrate the intricacy and specificity of inhibitory circuit wiring and contribute significantly to our understanding of inhibitory circuit dysfunction in neurodevelopmental disorders. Supported by grants from the European Research Council (ERC-2012-StG 310021) and Wellcome Trust (202758/Z/16/Z).